Some cars come along and create a huge buzz. From 2012 through last year, all of the internet car sites were raving about the Scion FRS and Toyota GT86 for making rear wheel drive hooliganism more achievable to more people and put Toyota back in peoples minds as something other than a boring company that makes brown rental cars for old people. This year, the focus seems to be turning more towards the new generation of hyper-cars. I'm of course talking about the Porsche 918, the Ferrari LaFerrari, and the McLaren P1. These cars are important not just because of the insane speeds they can reach and the alarming rate at which they can reach them. These cars mark a turning point in the development of the car. Normal people can now buy hybrids. The 918 and P1 (and maybe the LaFerrari, we'll find out soon enough) can be driven as all electrics around town and a combination in normal driving conditions and then, when you are really going for it, you can get the electric motors and the rather sizable generators at the same time to put out some amazing torque and horsepower figures with 0-60 times lower than I though numbers ever went. What I'm getting at here is, these cars deserve the hype they got. While it may have gotten a bit monotonous reading what seemed like the same FRS review on every website in every magazine for 18 months, the car stands for something. There are however, some cars not as deserving of their hype. Some cars that have been talked about and talked about for years and it doesn't seem like it will ever end. 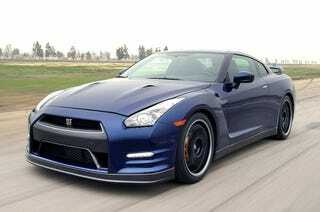 I am now talking about the Nissan GTR. And bear with me here, I do have an explanation. The GTR is a technological masterpiece, it's like the latest smartphones. It is technology at its peak getting you the best performance that it can. I have been lucky enough to have a ride in a GTR and I have to say, even in the short time I was riding I can honestly say it's the fastest thing I have ever been in. My main gripe about the modern GTRs is the price. Basically to get a GTR now, you're going to have to set aside $100,000. That is quite a bit of money. Back in 2008 when the GTR was launched in America, you could pick a base one for just under $70K. That is still a large sum of money, but it was remarkably cheap for the amount of performance you got. Most people will never be able to spend $100K on a single car for any reason, and while the $70K that it used to be may not sound a whole lot cheaper, think of how much car you could get for $30,000 in the used market. When the GTR first launched, it was a glimmer of hope for hard working individuals that one day, after the initial depreciation had done it's damage that they could work to buy a slightly used GTR to destroy nearly ever other car in the road. That hope is now mostly gone. Hearing anything into 6 figures for a car is unimaginable for pretty much all of us. With the old GTR you were getting an expensive car that performed like a really expensive car. Now you are getting a really expensive car that performs like a really really expensive car, and the only place for the prices to go from here is up. I realize that my opinion may not be that popular among the group that hold the GTR on some God-like pedestal that spend all day at their computer looking for people like me who dare to say anything against it. But that is exactly what it is, my opinion, we all have one. I want to hear yours. What cars do you feel get more praise than they deserve no matter how controversial? Let me know in the comments below.